In all areas of development, children with Down syndrome vary in their developmental progress. Many factors will influence this including genetic make up, environmental influences and supports received, as with any child. Additional medical problems if present (eg hearing impairment or seizures), or potential additional developmental difficulties (eg autism or ADHD) will also influence developmental progress. Research has identified a specific developmental profile of developmental strengths and weaknesses, typically associated with Down syndrome. However the degree to which any individual shows this pattern will vary. These are strengths, right from infancy-the children enjoy and learn from social interaction with adults and peers. The children have strengths in social skills, and in developing age appropriate social behaviour, if encouraged. This is usually delayed and may hold back progress in self care skills, handling toys in play and in writing. However the use of gesture to communicate is a strength. This is usually the area of most significant delay. Most children understand more than they can say. Signing is an important bridge to speaking. Speech intelligibility is usually a difficulty. Hearing difficulties may contribute to speech and language delay. This is specifically delayed relative to non-verbal abilities, particularly the verbal short-term memory component. Therefore learning from listening is difficult. Visual and spatial processing and memory are relative strengths. The children can be considered visual learners. Reading ability is a relative strength, possibly related to good visual memory skills. Number skills seem to be relatively delayed compared to reading skills. In typically developing children there is quite a wide range of normal development. DSMIG has not given specific guidance re developmental surveillance, but it is generally accepted that preschool development should be monitored and promoted through a multidisciplinary and interagency network, working closely with colleagues in Education. The recommended health surveillance programme aims to optimise health and prevent secondary factors impairing development. 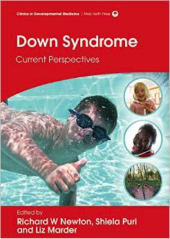 Developmental journal for babies and children with Down syndromeÂ Department for Education – Early support programme materials.